Now that the cold winter conditions are behind us and spring is finally here, many people have already begun their spring cleaning routine. From washing kitchen floors, vacuuming and dusting the bedroom, to reorganizing the living room — there are several tasks to knock out that will help revitalize the look of a home and feel of a home. However, amidst all of the areas in a home that are included in a spring cleaning routine, there is one area that is often overlooked or skipped. Garages and the extra space they offer is a great addition to any home. However, the use of garages has developed into something more than just their intended purpose of housing cars. Many homeowners use their garages to store a variety of items and belongings. From old clothing, furniture, and appliances to out-of-season holiday decorations, there is no guessing what you may come across in a garage. If you are like most homeowners, your garage can certainly act as a “catch-all” for just about any item you can think of. Before you know it, garages can become a cluttered, unorganized mess. Sometimes, garages can become so cluttered that there is no longer any room to park a car. Plus, with the nasty conditions we had this winter it is likely that salt, water, mud, and debris was transferred into your garage. This makes the spring an ideal time to clean a garage and get it ready for summer! Cleaning a filthy and cluttered garage can be a daunting task, but it should not be left out of your spring cleaning routine. To assist homeowners, we put together some helpful tips to quickly declutter, clean and organize a garage this spring-cleaning-season. Before starting any big home cleaning project it is important to first establish a course of action before tackling tasks. Simply putting garage cleaning on your spring cleaning to-do will not always be enough. Before you start cleaning out your garage, take a moment to analyze the area to get a good idea of what needs to be done. Create a checklist of certain tasks you want to accomplish and things you may want to get rid of. If you really want to be motivated, try setting some goals. Maybe those goals are fitting two vehicles inside instead, or creating enough space to install new garage cabinets. Creating a detailed cleaning plan and setting specific goals will help you get a better understand of what you want to accomplish. Depending on how cluttered and messy your garage is, it is unlikely that you will be able to fully clean it in a few hours. Most garage cleaning projects can be knocked out in a weekend, or back-to-back days. Be sure to set aside enough time to sort, clean, and organize items and areas in your garage. If you want to make the cleaning process go by faster, consider asking a friend or family member for help! Be sure to provide them with food and drinks for helping you with a less than glamorous task! In order to effectively clean and tidy up a garage, it is usually easier and less overwhelming to remove everything from inside of the garage to start the cleaning process. While this may seem like an exhausting and time-consuming task, it is ultimately worth doing if you want to have a tidy garage this spring and summer. The more you take out, the easier it will be to give your garage a top-to-bottom cleaning. Try to take out as much as you can — vehicles and all. If the weather allows, you can place the items from your garage in the driveway or yard. When removing items from your garage, take the time to group them five different categories: keep, sell, trash, donate, and recycle. When sorting through the items and placing them into different categories, don’t be afraid to add things to the “sell” and “trash” piles. Many people choose to hang on to certain items and belongings due to the fear of potentially needing it in the future. If you come across items you are unsure about, consider whether you will be using the item again in the near future, and whether or not it’s worth the occupied space and extra clutter. When you clean out your garage and throw away unwanted or unnecessary items along the way, it will be much easier to decide whether an item is worth keeping or selling. Once the garage is finally free of vehicles, items, and other clutter you can start cleaning the areas that would otherwise be hard to reach, such as the walls, floor, and garage door. These areas of the garage tend to be very filthy, especially after the winter. Although most homeowners don’t spend too much time in their garages, cleaning these main areas will help your garage look more appealing and comfortable. Follow these steps to give your garage a tidier look. Over time, garage walls can become covered with dirt. This can be an eyesore, especially with white walls. Before scrubbing down the walls, first use a vacuum cleaner with a hose to remove any cobwebs or layers of dust that is calcified to the wall. Next, use a bucket of water with a mild detergent to start washing the walls. To quickly clean your walls, begin at the bottom of the walls, working your way to the top in horizontal layers. After reaching the top, lightly wipe away excess water to avoid streaks and stains. The garage floor is likely covered with stains and debris, especially after the winter season. Start cleaning your floors by sweeping them, ensuring to remove as much dirt and debris as possible. Then using a garden hose and cleaning detergent, wash and scrub the flooring. Once that is done, finish by rinsing. If you garage does not have a floor drain, be sure to remove and dry any excess water remaining. If unsightly stains remain, consider hiring a garage floor coating service. Start by using a broom or brush to rid your garage doors of any loose dirt or debris. With the garage door close, spray the outside of the door with a garden hose to do a majority of the cleaning. After, use soapy water and a sponge to wipe both sides of the door down. Give extra attention to any stains that require it. Once the door is dry, be sure to quickly inspect areas that may need garage door maintenance or repair. Be sure to wipe the photo eye sensor lenses to ensure dust and debris isn’t getting in the way. Lubricate rollers, chains, and other parts as necessary. Now that your garage is clean and tidy, it’s time to find a home for the items and belongings in the “keep” pile. If there are items that you frequently use in the garage, such as a fridge or recycle bin, be sure to place it near the door for easy access. To ensure you have enough room for vehicles, park them inside the garage and start transferring items neatly into organized areas or spaces. One of the reasons garages become so cluttered is because there is not enough space to store items. 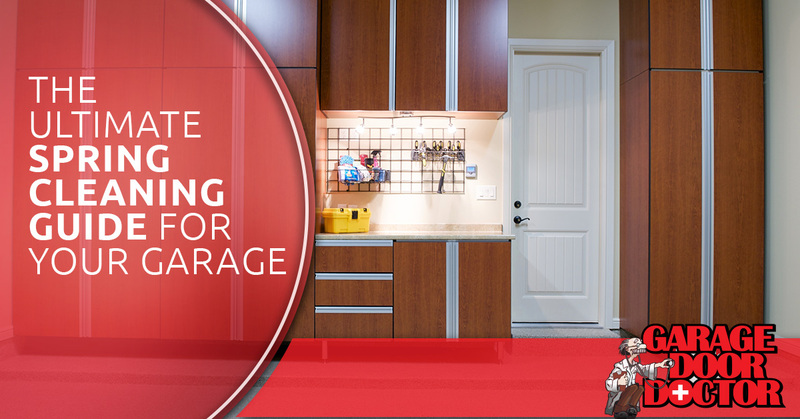 However, there are many simple storage solutions to create more space in your garage. Consider installing garage cabinets and shelves, hang your tools on a pegboard. Taking things off of the floor and putting them into shelves and cabinets will clear up more space for other items and appliances. The winter can take a toll on a garage door and the garage door opener. It is recommended that garage doors receive yearly routine service to keep it running smoothly. And now that you have a clean garage, it is the perfect time to schedule a garage door inspection with a professional garage door repair company. Scheduling routine maintenance with a garage door service company will make sure that your door is correctly balanced and aligned, properly lubricating rollers, hinges, and other necessary parts, and ensure that there is no visible wear or damage. Once your garage spring cleaning is finished,, you will want to make sure that all of your hard work pays off by maintaining its tidiness and organization. Do your best from allowing clutter to reclaim the space in your garage. Use the cabinets and storage shelves to keep clutter off of the garage floor. Be sure to sweep and hose down the garage floor to keep it free of dirt and debris. Hopefully, these tips will help you with your spring cleaning routine and a cleaner, more appealing garage. Be sure to remember this blog to repeat the same routine next spring, for a clutter-free garage all year-round! Need service for your Indianapolis Garage Door? Now that the temperatures in Indianapolis are looking more and more promising, this is the perfect time to start spring cleaning your home and garage. When you finishing your cleaning routine it is best to have a garage door service come out and inspect it to ensure it is operating properly. 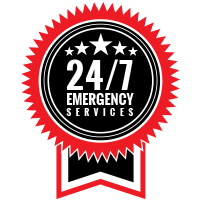 When you need garage door service in Indianapolis, IN and the surrounding areas, you can rely on Garage Door Doctor! Whether you are in need of garage door replacement, repair, maintenance, routine service, or garage door installation — whatever your needs are, the experts at Garage Door Doctor can help. 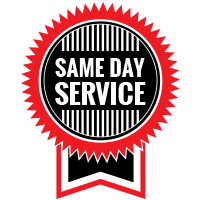 Request Indianapolis garage door service today!